It’s week 7 of the NFL season and with this post we are now officially caught up with our Seventeen Tips to Improve American Football series! Tip #6 – We need practical certifications offered and required of our football coaches. If you want to teach yoga, scuba diving, or even swimming, a practical, hands on course and certification is required, yet most football leagues and school districts don’t require any training whatsoever for football coaches and those that do require limited coursework usually offered online or in a classroom where theory is taught but practical, hands on instruction is not. Football is a physically demanding sport which can be dangerous if not taught correctly. Our kids deserve better. Online certifications are a good step forward but we need more. Talk to your local league or school district about requiring coaches to attend a practical, hands on course regarding football tackling and the coaching of a contact. Tip #7 – Learn to tackle and practice… WITHOUT helmets and shoulder pads! Tip #4 – Don’t underestimate the Approach when teaching proper tackling. Currently, much of form tackling teaching is spent on the contact point and finish elements of the tackle. However, many missed and poor tackles are the result of an incorrect approach. If a player cannot arrive to the ball carrier or point of contact correctly, it is very difficult to make an effective, proper, or safe tackle, regardless of form. Properly tracking the ball carrier, maintaining leverage, and preventing the ball from crossing your face are essential skills required for an effective approach. We spend a lot of time drilling and practicing our approach in our Run and Buzz Drill. For live video of this drill and others check them out Here in Part I of Tackling Dummies Smarter. Tip #5 – Rugby players are good tacklers, let’s do what they do and use the shoulder! Tip #2 – Sign younger kids up for Flag Football – Flag football is an underappreciated sport, often treated as a cheap imitation of tackle football. Hence, the huge rush to strap helmets onto our five- and six-year-olds. 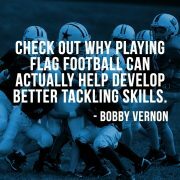 What everyone is failing to realize is that the skills and techniques one can learn and practice in flag football provide foundational knowledge that is difficult to gain in organized tackle football. Flag football is fun, can provide an opportunity to practice basic skills such as catching and throwing a football, and also requires more complicated skills that, if taught by a few experienced coaches, are much more valuable than the experience of strapping on helmets and running into one another. For example, spacing and leverage are two concepts that are very difficult to teach, particularly in a standard 11-versus-11 game of organized tackle football. It’s much better for kids to learn and practice these concepts in games of five or six per side. For receivers, it’s important to learn to recognize such things as whether the defenders are covering with man or zone technique, whether the players are using outside or inside leverage, and whether they are playing press or off-man. It may sound counterintuitive, but flag football can even teach tackling technique. Outside players are taught to pursue while maintaining leverage by keeping the opposing offensive player inside, and inside players are taught to work from the inside out, which properly corrals the offensive player for a defensive player to “make the tackle”—in this case grabbing the flag. It is also very important for defensive players to master pursuit angles and these are more easily taught, understood, and practiced with fewer players on the field. When you have eleven seven-year-olds in helmets and pads chasing a single ball carrier, it’s pure mayhem. There are no pursuit angles in a mob of players chasing and running into one another and falling down. It’s pointless. Flag football also teaches more than just proper positioning. Because the flags are placed on the hips, they provide a great reference point for defenders tracking the player. In tackle football, a very important concept is tracking the near hip with your eyes and maintaining leverage to get into proper position for the tackle. If flag players are taught this and practice tracking the flag in games, their skills at the next level will be wildly improved. Tip #3 – Recognize that playing experience is much more important than coaching. Many parents today push their kids into organized football at younger ages, which moves them from the parks and playgrounds to supposedly organized practice fields. Kids and their parents often believe they need coaching and instruction at a very young age to teach them how to play the sport and become great. But great players develop on their own, because of an innate passion for what they do. Coaches can teach techniques, skills, game plans and strategy. But coaches can’t teach instincts and certainly can’t teach passion for the game and the fun of playing it. These are things that must come from within each player. These are things that a player must develop through his own experiences and through trial and error. The playground or park experience without rules imposed by coaches or referees and without adult interference or interruption, is far and away the best way for children to learn how to play sports. No amount of coaching or instruction can replace or replicate the instincts and experience gained from lots and lots of pick-up games at the local park. 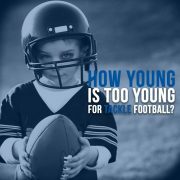 Tip #1 – Delay when your kids play tackle football. 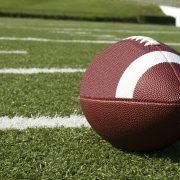 There are so many skills required to be a good football player and have fun, from basic skills like catching and throwing a football to more advanced skills and techniques like pursuit angles and leverage. It’s often difficult for these skills and techniques to be taught and learned in standard tackle football with 11 versus 11 player formats. Touch football at the playground or organized flag football is typically played with fewer numbers and therefore learning and mastering these skills and techniques is much easier. So in addition to preventing unnecessarily head injuries when our kids’ brains are still developing and therefore more vulnerable to concussions, by playing touch and flag football until middle school they will master these skills easier and become better football players. There will be plenty of time for tackling later. For now leave the helmet at home! This is the first of seventeen tips, one for each regular season NFL game week. (Yes, apologies I’m a little behind…) These tips are aimed at improving the sport and culture of American football. 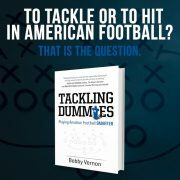 Expanded solutions and ideas on improving the game of football, making it safer and more fun for our kids to play can be found in my new book, Tackling Dummies – Playing Amateur Football Smarter. For more information please browse my website www.bobbyvernon.com. Football Tackling Drills, part of Tackling Dummies series which promotes “Heads Out” tackling and combines rugby style tackling and American football.